Very often the most simple ideas are also the most successful ones. 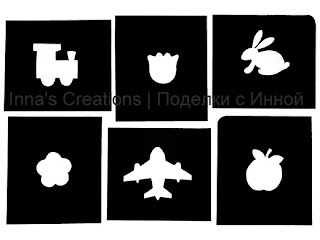 Try making stencils for your kids and see. 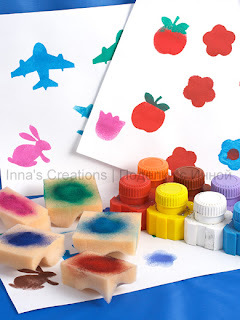 Stencils are easy to make even for those who aren't very crafty, they don't take up space at all, and are easy to use. At the same time they let you explore your creativity: you can combine a number of stencils, make prints of different colour and density, and so on. You can also make brand new stencils whenever you wish! As usual, I tried to use only available materials. It turns out that plastic file folders make excellent material for DIY stencils. They can be easily cut with a crafts knife and washed in running water after being used. In order to make a stencil first outline the picture with a ball pen. You may also trace any existing stencil (we have cardboard stencils as part of a board game, for example), or even press a picture into the plastic. Then you'll have only to cut out the stencil and print. You can make 12 middle-sized stencils out of an A4 file folder, 6 from either side. 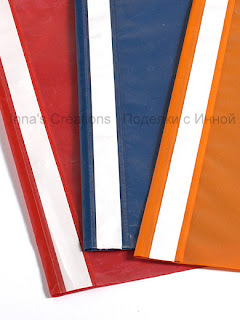 For printing you will need paints and pieces of sponge (old bath sponge pads, for instance), a piece for each colour. Just spread the paint over the sponge and poke it into the stencil. Good luck! Hi..the tutorial for poppy and dandelion flowers helped me create those flowers too...they really look lovely...i have updated my blog with some more cards..http://shrutiartgallery.blogspot.com/. do checkout. tc and keep posting. i love your posts..
Hey it's nice to come across your blog ...even I try and recycle as much as possible through art and through lifestyle changes. This is a nice idea of making stencils - i'm gonna try it sometime. This is a great idea. Thank you a lot !